Nobody in NASCAR is counting on the power of home cooking more than No. 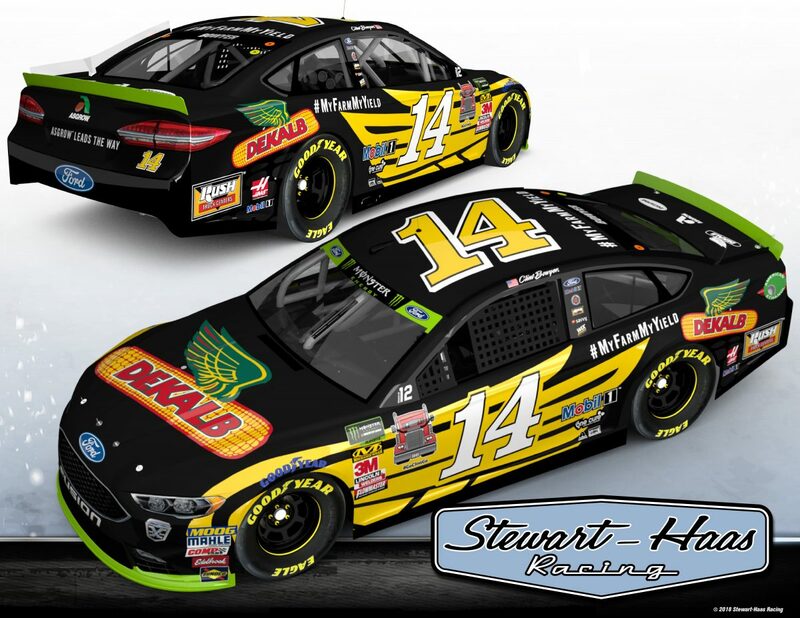 14 DEKALB Ford Fusion for Stewart-Haas Racing (SHR) driver Clint Bowyer this weekend when the NASCAR Monster Energy Cup Series races Sunday at Kansas Speedway in Kansas City. Bowyer is a native of Emporia Kansas, a town of 25,000 people about 110 miles from Kansas Speedway. He rightly calls the 1.5-mile oval his home track. “Obviously, you want to win the Daytona 500, a championship, things like that, but winning at your home track is right up there,” said Bowyer, who owns two top-five finishes and six top-10s in 20 starts at Kansas. Bowyer will debut a new primary sponsor at SHR when he drives the No. 14 DEKALB Ford Fusion onto the Kansas track. DEKALB announced its partnership with Bowyer and SHR in August at the annual Farm Progress Show in Boone, Iowa inside its “Fuel Your Yield” tent. DEKALB will serve as primary sponsor for Bowyer and the No. 14 team this weekend with the brand serving as an associate partner at all other races. DEKALB has been helping farmers ensure a future of performance with industry-leading corn seed products for more than 100 years. And while driving a purpose-built racecar that puts out more than 850 horsepower is his day job, Bowyer is also a farmer in North Carolina. Bowyer’s heart is still in Emporia, where he’s a big part of the community. In March 2013, he bought the Clint Bowyer Autoplex car dealership on U.S. Highway 50, where he once worked as a lot attendant, dent specialist and detailer. Across the street sits the Clint Bowyer Community Building, constructed in 2012 thanks to a $1.5 million donation from his foundation. Inside are 25 computers at the public library. There is a scoreboard at the aquatic center, a video camera at the auditorium, shoes for the Big Brothers-Big Sisters program, backpacks for kids, Christmas trees for needy families. And, in nearby towns, playground equipment and the reconstruction of a tornado-ravaged community center – all of it and more paid for by Bowyer’s foundation, or out of the driver’s own pocket. Why should fans go to Kansas Speedway? The Chiefs game has been moved to Sunday night after the race. Are you going? Thoughts on SHR’s Talladega performance last weekend?